You may receive updates from Fossil Free California, the sponsor of this petition. To REI: Break Up with US Bank! REI’s use of US Bank for the REI credit card represents a failure of social responsibility. US Bank continues to finance oil and gas pipelines. Banking with US Bank is not compatible with REI’s professed values (“purpose before profits”) and those of many of its customers. Direct and indirect financing from banks continues to enable exploration and development of fossil fuels, despite the overwhelming evidence that we need to “keep fossil fuels in the ground”. As members of REI and environmental activists, we know REI can do more to align its business practices with its values. We, the undersigned, join with thousands of REI customers and stewards of a healthy planet to demand that REI cancel its contract with US Bank and work with a credit card company that declines to invest in climate-damaging projects. As members of REI and environmental activists, we know REI can do more to align its business practices with its values. As you know, a recent petition asking REI to divest from gathered over 27,000 signatures. We, the undersigned, join with thousands of REI customers and stewards of a healthy planet to demand that REI cancel its contract with US Bank and work with a credit card company that declines to invest in climate-damaging projects. We are confident that you can negotiate a new card contract with a non-polluting financial institution such as those listed by Green America. 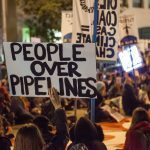 US Bank continues to provide hundreds of millions of dollars of corporate financing to pipeline companies for general use, including pipeline construction. US Bank extends lines of credit to many oil giants, including Enbridge, Energy Transfer Partners, Phillips 66, and Marathon. US Bank also finances Cabot Oil & Gas, DTE Energy, EQT, National Fuel&Gas, Plains, Range Resources and Williams. While US Bank has reportedly discontinued providing project-level loans, US Bank is certainly responsible for the continuing construction of thousands of pipelines. We stand with thousands of members who will support and celebrate your leadership in taking this step to help avoid the looming climate catastrophe. The United Nations’ “1.5 degrees” report issued in October 2018 confirms that we must take urgent and unprecedented action over the next twelve years to avoid the worst consequences of climate change. Please act now.